Peter Goldbeck is a world renowned Healer, Clairvoyant and Medium. He is an internationally recognized Reconnective Healer that has been working with alternative healing modalities since his first attunement, courtesy of Mother Nature in 1985, as the result of a Lightning strike. Peter participated on staff at St Vincent’s Hospital with the 9/11 Integrative Stress Management Program and with Bronx Aids Service using his healing energies to help treat tens of thousands of World Trade Center victims. He is a practitioner for the Edgar Cayce A.R.E (Association for Research and Enlightenment) Center and is a member of the Queens Psychic Club. Peter can been seen on the TV show "Alexandra's Psychic Eye" airing on Channel 57 NYC Time/Warner Cable and on Staten Island Cable. Also on “TildeVision” and "Psychic Awakening," on Queens Public Access Television (QPTV) filmed at the Queens Psychic Club on QPTV Ch#35 & 34 (Time Warner QPTV, in Queens only). Other boroughs, check your TV guide stations for dates and times. In this class learn: the history of Reiki Healing, Reiki Ethics & Precepts, Healing Hand Positions, Disease cause/effect and treatment, & Two attunements to increase energy flow and lots of practice opportunities!! 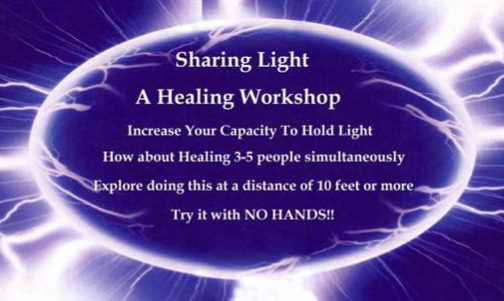 This will provide time and space for one to experience Reiki as well as practice it. After receiving attunements and studying Reiki, the most important factor by far os actually practicing Reiki. Practice what you've learned, pick up some extra attunements and fun to help you blossom. Lots of fun, newbies welcome!!! More Info on Peter at A.R.E. Peter is available private readings are available by appointment and by phone. *The Reconnection is the umbrella process of reconnecting to the Universe, which allows Reconnective Healing to take place. These healings and evolutionary frequencies are of a new bandwidth brought in via a spectrum of light and information. This is something new. This is different. This is real—and it can be entrained in each of us. Some describe The Reconnection as a "life optimization" process—your life experience becomes enriched, more profound, and the right opportunities to fulfill your potential arise at just the right time. The Reconnection is the evolved form of the "axiatonal alignment" which ignited Eric Pearl into his life path. This once-in-a-lifetime procedure awakens your unique potential in this world through this energetic exchange. This is a 2-day session one-on-one procedure. Receiving The Reconnection (also called a Personal Reconnection) attunes you to the Reconnective Frequencies, empowering your evolution beyond that of our distant history. This attunement draws in and activates "new" axiatonal lines that connect you to the energetic gridlines of our planet and extend into multidimensional reality. This allows for the exchange of light and information within a vast, multidimensional circulatory system.